Work on ten stunning homes on ‘The Island’ in Summerseat is complete and a special open day is being held on Saturday 6th April (9am – 1pm) where Hillcrest will unveil two new showhomes to showcase the spacious and stylish accommodation offered and the development’s idyllic location. Situated off Railway Street next to Summerseat Nature Reserve and accessed via a private bridge over the picturesque River Irwell, The Island provides a peaceful retreat from the ‘hustle and bustle’ yet is perfectly placed for easy access to local amenities and commuter routes to Bury, Bolton, Blackburn, Preston and Greater Manchester. A range of styles of home are offered, from sympathetic conversions and new build properties to comprehensive refurbishments, all offering spacious four-bedroom accommodation and designed to complement the area’s history, buildings and natural surroundings. Originally established as a reservoir supplying Summerseat’s cotton mill in the 1800s, then home to a brick-built print and dye works, ‘The Island’ has been an integral part of the Lancashire landscape for decades. Today, the story of The Island begins a new chapter as a haven for peaceful living in luxury. Each of the homes on The Island is finished to an exemplary standard and provides ample opportunities to fully enjoy the picturesque surroundings. 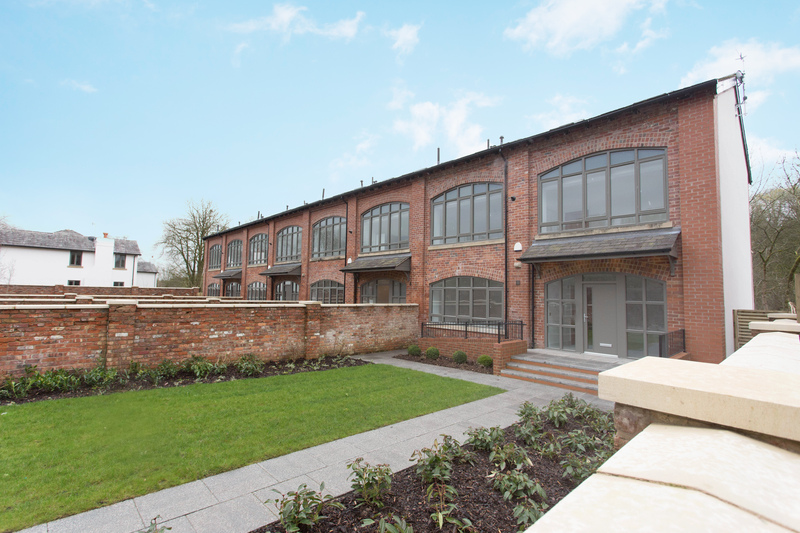 The characterful mill building has been thoughtfully converted into four substantial three-storey terraced homes providing living accommodation suited to today’s families, whilst retaining the building’s unique character with many original details retained. These 2,600 sq ft four-bedroom homes, offer open plan living space alongside carefully created layouts for study areas and snugs as well as a luxurious master bedroom with dressing room, en-suite and terrace. Nestled at the end of the development are two pairs of sympathetic new build semi-detached homes, one of which is dressed as a showhome, offering an alternative four-bedroom option of 1,500 sq ft of accommodation across two floors, including easy-flow living space, terrace, integrated garage and generous storage. Set slightly separate to the rest of the homes, are two large detached homes one of which is full dressed as a showhome, which have been comprehensively refurbished to exacting standards and are set within large landscaped grounds with private driveways. Accommodation is set across two floors with open living and dining areas running the length of the house and kitchens with French Doors out to a patio area for al fresco dining looking over the gardens and River. Upstairs are four generous sized bedrooms, including a fantastic master bedroom with dressing area and en suite. All homes at The Island have been specified to the highest standards with a pride in attention to the detail. The kitchens have been designed in partnership with leading designers Stuart Frazer, providing high quality schemes by SieMatic incorporating appliances by Siemens, and finished with stunning quartz stone worktops and Amtico flooring. Plus, the bathrooms feature sanitaryware from Duravit, brassware from Vado and Hansgrohe and porcelain floor and wall tiling throughout. Simone Milner, Sales Manager at Hillcrest Homes says, “We’ve thoroughly enjoyed creating these beautiful homes in such a special location. It’s a quiet and picturesque retreat where you can relax and immerse yourself in nature. There is so much to do right on the doorstep too. Great countryside right on the doorstep for walking, biking and running and some fantastic country pubs to relax in afterwards! Its been a pleasure to spend time here and we know that the people who get to call The Island home will love it too. Situated in the Irwell Valley, Summerseat offers so much to new residents. Thriving village life, rural walks and some excellent schools are right on the doorstep and history is a few miles away on the East Lancs heritage railway, which hosts The Flying Scotsman on occasion. The development has been funded in association with Together. Prices at The Island start from £495,000 for the four-bedroom semi-detached homes, from £540,000 for the four-bedroom mill conversions, and from £575,000 for the detached homes. The four-bedroom semi-detached homes are available to buy via the government’s Help-to-Buy scheme. Visit www.helptobuy.gov.uk to find out more. The showhome and development unveiling will be held at The Island on Saturday 6th April between 9am to 1pm. For more information please contact Miller Metcalfe Estate Agents on 0161 358 0910. View a brochure and images of the development here.